You might think all this drama is a little over the top for breakfast, but not me. 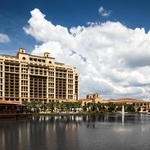 It’s all part of giving a hotel character. Making it a little bit special. 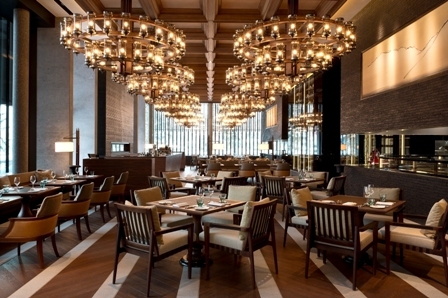 And believe me, when it comes to The Chedi Andermatt there is no shortage of standout episodes because this is the perfect example to define what five star luxury stands for. Under the ever watchful eye of General Manager Jean-Yves Blatt, a veteran of the legendary Grand Hotel Park in Gstaad, he takes advantage of every Swiss franc invested by Egyptian billionaire resort developer Samih Sawiris to do this stunning new property justice. You could say this is an architect’s dream project; a property where simply no expense has been spared in showcasing the very best in Alpine luxury lodging blended with Asian hints, from the Hästens beds in stadium size guestrooms, to the extraordinary lobby lounge with its infinity view of the 35 metre indoor pool beyond. “The hotel was designed to remind guests of home” Jean-Yves tells me, “everything easy to access with plenty of relaxing spaces”. I’m reminded of this as I wander around the lobby level because, unusually in a hotel this size, all the public rooms that matter are here on this floor; the main restaurant with its western kitchen on one side and Asian on the other, the impressive spa, the bar and Living Room (the place in town for après ski I hear) the Hide Yamamoto inspired Japanese restaurant and so many comfy lounges I need a map to navigate my way around. 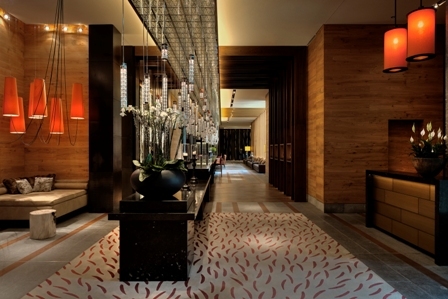 Even the reception is designed to feel homely, just an elongated table stretching from the reception to the lobby lounge. The clean lines are very Asian, but also efficiently practical, as is the Swiss way of course. As I take in the long reception table I reminice my check in moment; not just a refreshing towel and a smile, but also a drink and a dark chocolate treat too. They know the way to a man;s heart. Upstairs, my room is an essay in chic hospitality. Not just the sheer size, (which is typical for all 100 rooms, a generous 53 square meters is the entry level space), or the aforementioned Hästens bed, but the hand painted murals, the dark wood flooring, the cosy gas fireplace and a bathroom area almost half the size of the bedroom. A generous bath with a separate tropical shower room, his and hers sinks, a heated natural stone floor and luxurious Acqua di Parma toiletries. A welcome surprise is the complimentary soft drinks and juices in the mini bar below an impressively high end espresso machine. For me though, the in room iPad controller is the genius twist. The Chedi Andermatt has its own software built into an iPad to control the lighting, the window blinds and the room temperature. With one press I turn off all the lights and rejoice. So often in hotel rooms I end up with a stubborn light whose off-switch evades discovery. Outside on the balcony, the view is of course unforgettable; the mountains are everywhere, the comforting clank of a cow bell or two from the pastures and in front of me, the Glacier Express edges its way up the pass. It is a picture postcard Alpine scene. 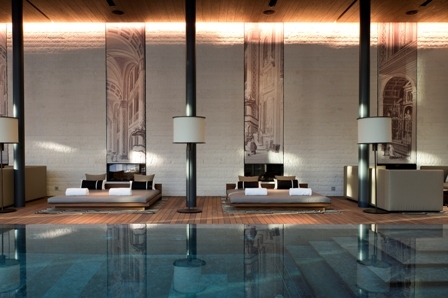 Back downstairs, the spa awaits; almost 2,500 square metres of health and wellness, pampering and preening. Of course, a plethora of indulging treatments from trained in-house therapists are on tap to keep my yang and ying balanced using spaRitual, ila, REN, Alpienne local folk remedies, pure olive oil, lanolin and even beeswax if i so choose. 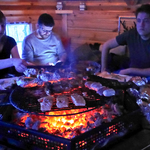 I forgo the treatments and just wallow in the saunas (Finnish and Bio) the steam room, the sol steam bath, the Jacuzzi and the hot and cold plunge pools. I feel very decadent. 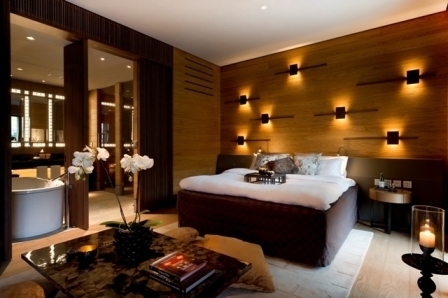 it’s summer now, but I can imagaine in winter, the Chedi Andermatt transforming into a cosy luxury alpine retreat, the ski in and ski out access perfect for the ultimate escape to snowy slopes and a return to hot chocolate around a roaring fire, your ski butler whisking away all your equipment until next time. Hard as it is to leave the Chedi’s embrace, a few paces outside and I’m in the historic village of Andermatt. This is a village that was once whispered about in the same breath as St. Moritz or Verbier, even Queen Victoria was a fan. 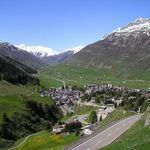 Such was the fame of Andermatt due to its position at the crossroads of Europe, until war changed everything. The army came to live here to protect Switzerland’s borders and stayed for another 60 years. The village watering holes had a sudden change of clientele. Today, the army has gone and good times are ahead for the village again thanks to the vision and deep pockets of Samih Sawiris. My waiter notices my empty latte glass and with a brief nod from me, returns with another steaming cup. Curtain up, it’s show time again. 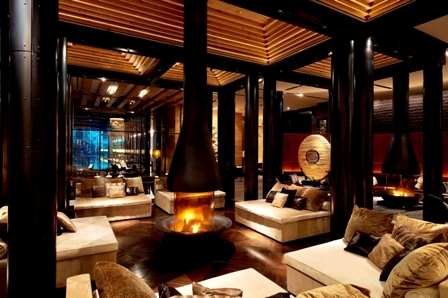 I want to stay at The Chedi Andermatt. Tell me more. 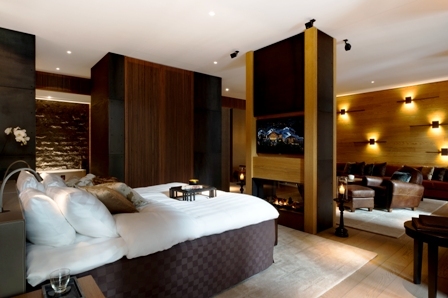 Nightly rates at The Chedi Andermatt are from CF 525 depending on season. 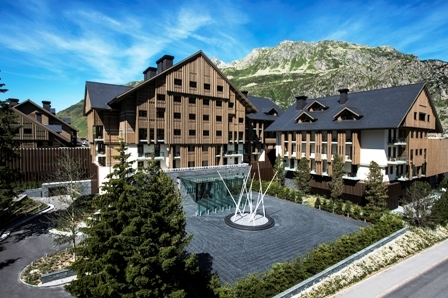 The Chedi Andermatt also offers a unique scenic Swiss train experience package: The the famous ‘Glacier Express’ travelling from Andermatt to St. Moritz.